Can You Tell Which Is The Real Gundam Toy And Which Is A Mere Illusion? We're suckers for the mind-blowing properties of a perfectly placed anamorphic image. 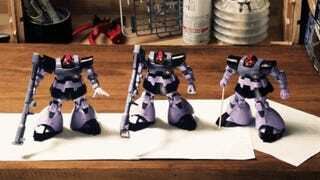 And in this video, there are flat images hiding in a collection of Gundam toys. Can you tell which ones are real?